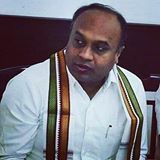 If merit is the criterion, then Congress leader Brijesh Kalappa (in picture) is the right candidate to represent the Mysuru-Kodagu seat. Brijesh is a Supreme Court advocate and has been an articulate spokesperson of the Congress. The fact that a person from Kodagu has not found representation in Lok Sabha for decades, should weigh with the parties in the choice of candidate. In the present state of politics, only ‘winnability’ matters. Though Brijesh has been short-listed, he is unlikely to make it to the final list, considering the fact that the Kodava community to which he belongs, is numerically weak, compared to Vokkaligas and Kurubas. The Congress and JD(S) have entered into a seat-sharing arrangement in the upcoming Lok Sabha elections. The Mysuru-Kodagu seat is one of the 10 seats the JD(S) asked during its negotiations with the Congress. The Deve Gowda clan has offered the Mysuru seat to Sumalatha Ambarish, if she stays away from Mandya where the JD (S) wants Nikhil, son of chief minister Kumaraswamy to contest. To sum up the situation, Kodagu has lost its political clout and is merely a ‘joker in the pack’. We don’t want congress government or any candidates for congress.. Fully endorse the Palachanda B Kalappa candidature. Pray he is not sacrificed like a Sumalatha. Someone of Brijesh’s caliber should have been in BJP. He’d have been the ideal candidate.